One of nature’s most unusual “odd couples” is the massive shark and the little striped pilot fish. Instead of being the next meal for the shark, the intrepid little fish has somehow worked out a collaborative relationship. 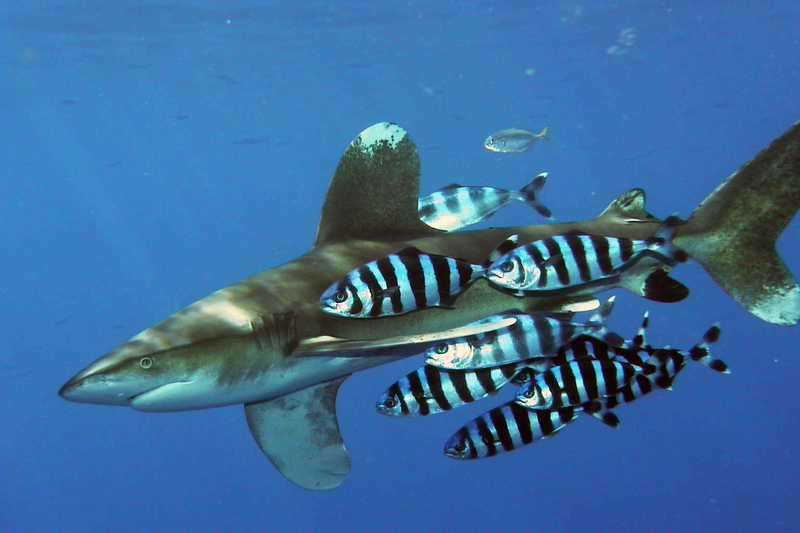 In exchange for the shark’s protection from other predators, the pilot fish scouts new feeding grounds and provides a valuable service by cleaning parasites off the shark’s gills. At first glance, the pilot fish might seem a little crazy. Who makes friends with sharks? But the pilot fish is not worried about what other people think. Above all, the pilot fish is an original thinker, a trailblazer, swimming fearlessly into new territories and forging unexpected and unlikely alliances. In honor of this spunky little creature, I’d like to announce the Pilot Fish Trailblazer Awards, which will nominate people from around the world for their forward thinking and problem solving in difficult or seemingly impossible situations. I’m sure you agree that the world is at a political, cultural, and religious crossroads. We are surrounded by so much strife and so much polarity in society and in our political institutions. All around us, we hear a lot of complaints about the problems, but we see little action. We see elected officials in the government and public service guided by self-interest and greed. But amidst the noise and chaos, a few visionaries look to the future. Instead of problems, they see opportunities. Instead of complaining, they act. These trailblazers need to be recognized and honored. They may be famous or virtually unknown. They may be alive or deceased. They may be a single person or a group of people united around a common cause. They are generous people who look beyond their own self-interests and reach out to others. Their efforts may have focused in a specific area–like politics, medicine, the arts, human rights–or they may have had a broader impact on a group of people or a society. Why do I want to do this? Now more than ever, we need to highlight people who can offer guidance and solutions to complex problems. We need to move forward as a global society and end the stalemates that have paralyzed and fragmented our political institutions. We need forward thinkers who can see beyond the present and their own self-interests to help shape a better future for themselves, their families, and society as a whole. Over the next few weeks and months, I’ll be posting my nominations for the Pilot Fish Trailblazer Awards. Use the voting option at the end of the post to select your favorites. I also invite you to nominate trailblazers that you know. Send me your nominations in the comment section below. Better still, contact me if you’d like to write a guest post highlighting a trailblazer from your community or country. You can contact me through the comments section below. I’d love to hear your thoughts about this! And have a great week. Sounds interesting. I look forward to seeing who you feature. Hi Colline. Great! I have you wondering, don’t I?? Let me know if you think of anyone from Canada that should be nominated. If you’d like to write a guest post about that person, that would be terrific too! I will think on someone. I should like to nominate the Viva Foundation!!! Hi Herman. Wonderful! I will read through your links and suggestions. Let me know if you want to write a guest post about someone in particular that you admire. That would be Meleney Kriel of the Viva Foundation!!! You have me wandering who you will nominate. Hi Sally. Great! I’m delighted that you’re wondering who’s going to be featured. Let me know if you think of someone who would be a good nominee. Thanks for your thoughts!! 🙂 Excellent idea, great post! I am very curious as to whom you will nominate. I’m so glad you’re anxious to see the posts on the winners. Um…no hints yet. 🙂 Stay tuned! Hi Amy. So glad you think so! I love looking for the hints of the future within the present time! If you hear of anyone that is a good candidate, just let me know. Thanks! Hey Patti, this such a fantastic idea and a great initiative on your part. Would be looking forward to reading the stories about such people. So glad you like this series, Norma. I’ll be posting another nominee soon. Stay tuned! I’m just now catching up on my reading, Patti, and I’m delighted to come across this post. What a terrific idea! It’s so easy to overlook the many people who are out there doing great things to help improve their corner of the world. Thank you for sharing the work of these trailblazers with us. 🙂 I’m heading over to read the first post right now. Hi Jackie. I’m delighted that you like this idea. I’d love to hear your suggestions for other trailblazers! A brilliant idea – I’m looking forward to seeing how it develops. So glad you like this idea, Leya! I want to share some uplifting ideas and spread the word about inspiring people. Wow! Thanks for the compliment! I just get so tired of the mainstream doom and gloom news. There is a lot of good going on in the world and we need to remember that!